The high-horsepower Case IH Steiger Quadtrac tractor range has been released in Australia with a range of all new features. Case IH has upped the ante in 2016 with a range of upgraded features on its new high-horsepower Steiger Quadtrac tractor range. A full 360 degrees of LED illumination for night work is just one of the upgrades that now comes as standard. The driving forces behind all the new features on the 2016 models are better durability and helping farmers to be more productive. "Australian farmers tend to do a lot of paddock work at night," Case IH high horse power product manager Pete McCann says. "That’s because sometimes there are not enough daylight hours, or they just keep going until a job is done, or they are making the most of the conditions. "Having every light possible on these tractors will really help productivity." Other upgrades include a change to the 6500 heavy-duty Camso belts to better support the high horsepower. "You need the heaviest belts available when you’re using 600hp (447kW) so we’ve included the 6500 belts as standard on new models," McCann says. Advanced steering has also been introduced, as a speed-reactive system that helps the driver during headland turns and line acquisition, reduces the amount of physical turns while in the paddock and increases the stability of the Steiger while in road mode. A new automatic diff lock actuator has been added, which disengages as the driver steers into the turn, then re-engages as the tractor straightens up. "This means drivers don’t have to tap the brake to get the diff lock to disengage for sharp turns, and is just one more little feature we’ve added to the 2016 model as standard," McCann says. 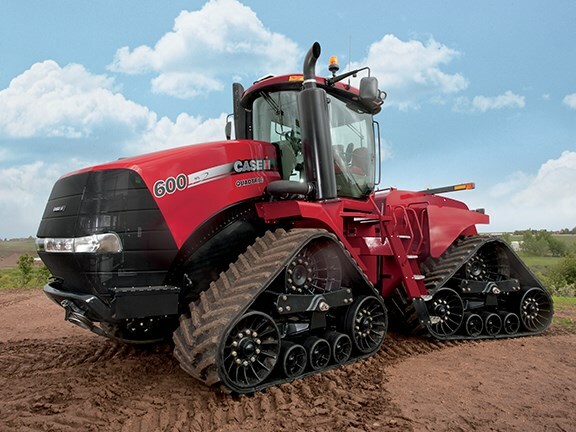 "Case IH is an innovator in track design," he adds. "We launched the technology 20 years ago and our experience, knowledge and understanding have kept us at the forefront." The five-axle design gives its four-track system tractors a smoother ride and more power to the ground, according to McCann. He says the five-axle design features independent oscillating tracks which provides better flotation in the field and reduces compaction, which in turn results in lower ground pressure and a more agronomic seed bed.